Skylodge: Sleep in a glass pod dangling off a cliff. 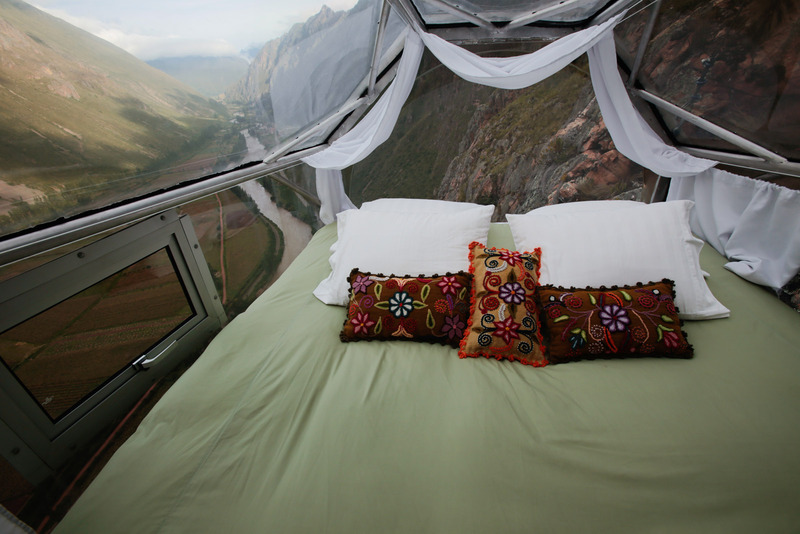 On an Andean cliff overlooking Sacred Valley, there are three ovular glass pods dangling from the rock face. They’re not art, nor are they UFOs. They’re hotel rooms. The “Skylodge” is owned by a tourism company called Natura Vive, and these three suites comprise the entire luxury hotel. The three pods are the size of a tiny airplane cabin, and are transparent on all sides. They’re mostly bedroom and bathroom, with the first taken up entirely by a down bed and the second equipped with curtains for privacy. There’s not much to do in the pods, but then again, you’re not coming for comfort. Just to get there you have to hike up 1,200 feet of Via Ferrara or zipline in (for extra cost). Once there though, you’ll have a bird’s eye view of the valley below, the surrounding Andes, and condors circling in the open skies above.